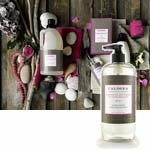 Rosewater Driftwood Products by Caldrea | P.C. Fallon Co.
Rosewater Driftwood envelopes you with its warmth, created from the pure essential oils chamomile, cedarwood, and marigold and the fragrances of white musk, rose, gardenia, lily of the valley, and grey vetiver. Make your laundry room more cozy with dryer sheets, fabric softener, and laundry detergent, or add some beach house ambience anywhere with a Rosewater Driftwood candle or linen & room spray. For the kitchen, try Rosewater Driftwood all-purpose cleaner, countertop spray, and dish soap. Keep your hands soft and moisturized with hand balm or hand lotion.